This story was first published on June 30, 2017 and updated on Sept 27, 2017. SINGAPORE - From this Sunday (Oct 1), smoking will be banned in the outdoor areas of universities and within the compounds of private institutions, though it will be allowed at designated smoking areas. Smoking will also be banned within 5m of schools like preschools, madrasahs, junior colleges and polytechnics, said the National Environment Agency on Tuesday (Sept 26). Excursion buses, trishaws and private-hire cars used by firms such as Grab and Uber will also be added to the list of places where smoking is not allowed. 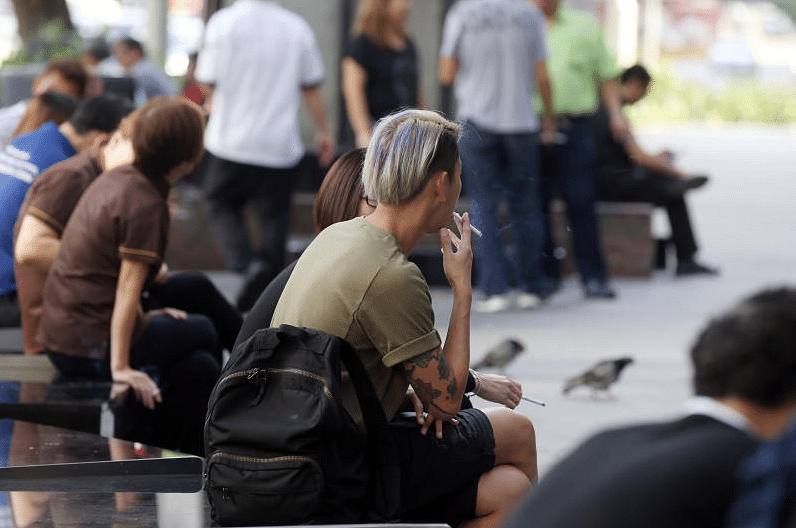 The move is an extension of the Smoking (Prohibition in Certain Places) Act, which aims to reduce the exposure of the public to second-hand smoke, and also supports the national effort to promote a smoke-free lifestyle in Singapore. The public will be given some time to adapt after the ban begins, said the NEA. It will "take an advisory approach" in the first three months and will verbally warn those caught smoking in the prohibited areas. However, those who carry on smoking despite prior warnings may be fined. Whether you are a smoker or not, here are some other rules on smoking that you might want to know. Already banned from lighting up in pubs, markets and ferry terminals, smokers here will have even fewer opportunities to take a puff as the National Environment Agency (NEA) will not be accepting applications for new smoking corners in all food retail establishments islandwide with immediate effect. In addition, smokers will also no longer be able to light up at public areas at Orchard Road, except at designated smoking areas, from July 1 2018. To deter young people from taking their first puff, the minimum legal age for smoking will be raised from 18 to 21. This decision was announced during the parliamentary debate on the Ministry of Health's budget on March 9 this year. To be phased in over a few years, the new regulations mean that under-21s will be restricted from purchasing, selling, using, and possessing tobacco products. Operators and managers of premises are required by law to stop patrons from smoking in "no smoking" areas, or to request patrons who refuse to cease smoking to leave the premises immediately. The NEA clarified this in January this year in response to several Straits Times forum letters . The agency also stated that "No Smoking" signs must be put up within areas where smoking is prohibited. If you are a manager or operator of a premise and you fail to comply with these regulations, you may be slapped with a fine of up to $1,000. 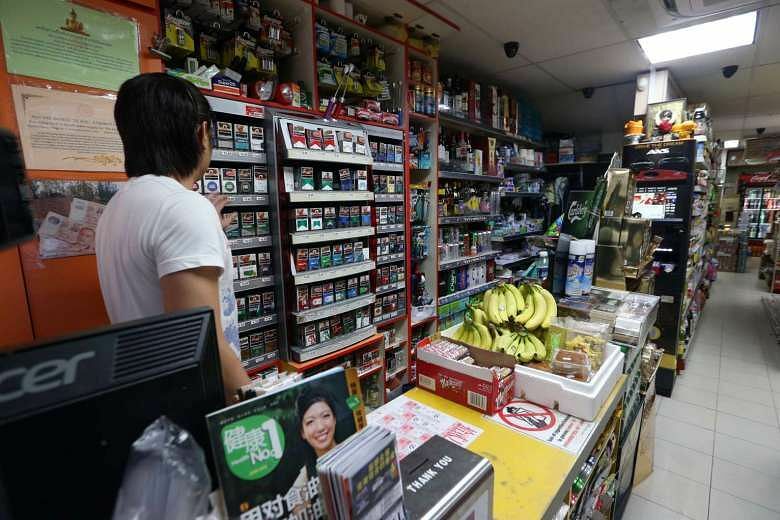 In its latest announcement on Friday (June 30), NEA said it will not be accepting applications for new smoking corners in all food retail establishments island-wide with immediate effect. Existing corners in food retail establishments will be allowed to remain until the current licence is terminated or cancelled. From August 1 this year, retailers will have a one-year grace period to comply with a point-of-sale display ban on tobacco products. This means that tobacco retailers will be required to use plain, undecorated storage devices to keep tobacco products within their premises out of the direct line of sight of the public and potential customers. Should customers enquire about prices of tobacco products, a text-only price list, which must fulfil MOH's requirements, may be shown, but only upon customers' request. The new regulations were approved in Parliament in March last year. 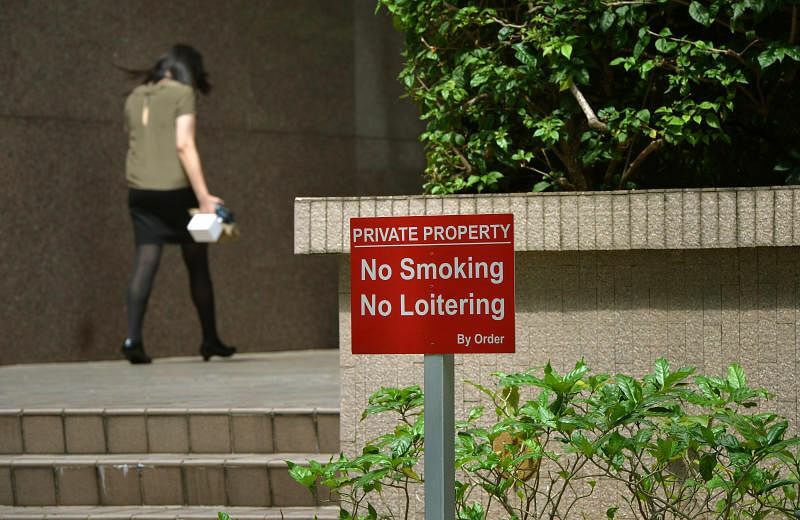 While you may still smoke within places such as your own HDB apartment, your car, and in surface carparks, there are a whole slew of places where smoking is prohibited. These include: Vehicles such as private buses, school buses and taxis, within 5 metres of a bus-shelter or entrances and exits to indoor areas of buildings and facilities where smoking is prohibited, on overhead bridges; reservoirs, and parks under the purview of JTC Corporation or in public housing estates managed by respective Town Councils. However there are exceptions. 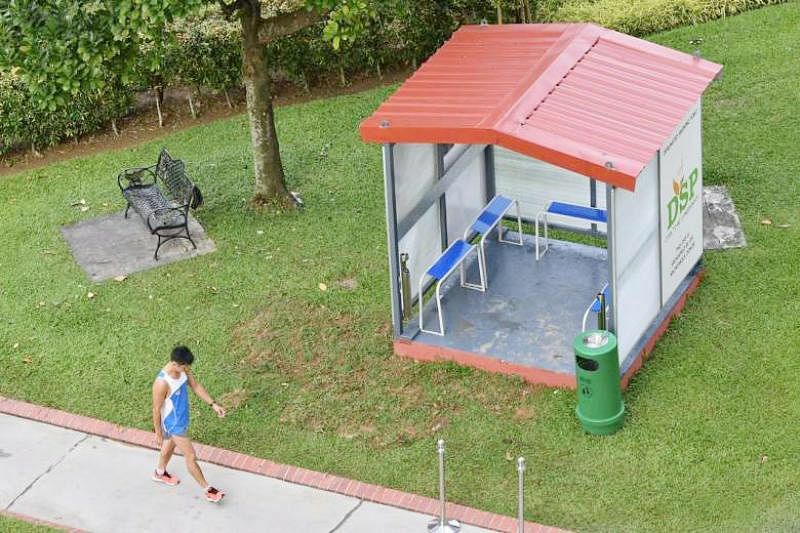 In January, it was announced that Nee Soon South's HDB estate is slated to have 50 smoking "pavilions", 3m by 3m sheds located a distance away from the HDB blocks where smokers can light up without penalty. 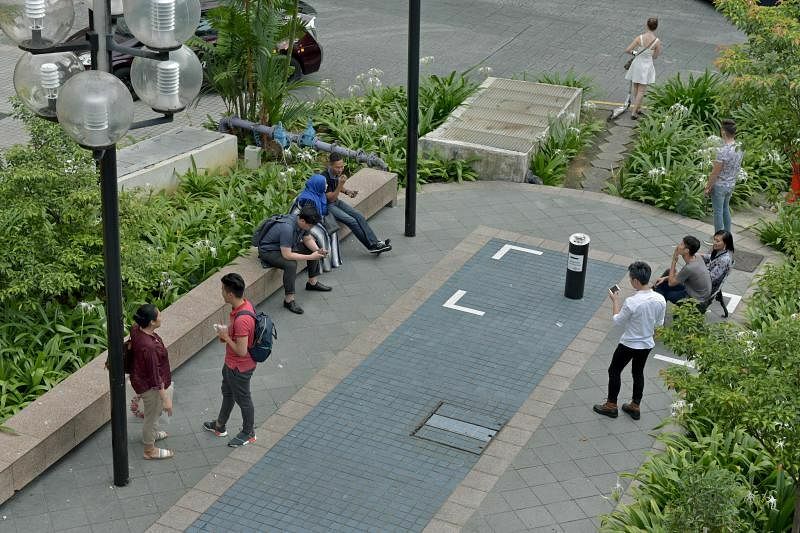 Five designated smoking areas have also been set up along Orchard Road, demarcated by white "boxes" painted on the ground. This is in addition to existing designated smoking points set up outside some shopping centres in the district.